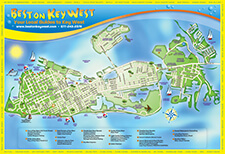 Best on Key West offers an exciting afternoon of snorkeling at the Great Florida Reef, the third largest reef in the world. This unique ecosystem is home to thousands of species of fish, sponges, coral, turtles and more, and you can see it up close during our afternoon reef snorkel tour. Whether you're a novice or expert in snorkeling, we invite you and the whole family to come see the remarkable beauty the Great Florida Reef has to offer. Situated just 6 miles seaward of the Keys, the reef is located in relatively shallow water, typically between 15 feet and 30 feet deep. As the No. 1 diving destination in the world, the reef attracts millions of visitors who can explore and appreciate the delicate ecosystem. You'll have a remarkable view from the Marquesa, a 69-foot Catamaran that boasts one of the largest sails in South Florida. During your excursion into the beautiful coral, you may glimpse seahorses, angelfish and lionfish, as well as turtles and dolphins. The reefs are home to millions of creatures and marine plants so there's something new around every turn. And the reef never stays the same -- seasons, climate, plant growth, and the various life routines of the marine animals ensure the reef constantly changes. If you've taken our tour before, we invite you to return and experience how the reef has grown since you were last here. This 3 and half hour tour sets sail at 1 p.m. on our state-of-the-art catamaran and heads straight to the reef. There's plenty of seating on this spacious deck, and while awaiting arrival to the reef, our crew provides safety instructions and demonstrates how to properly use the snorkeling equipment. We provide a snorkeling mask, snorkel, fins and buoyancy compensator for all our underwater adventurers. Our crew is capable of answering any questions you may have during this time. Once we arrive at the snorkeling area, passengers may descend our "Stairway to the Sea," a staircase running from the deck to the water level for easy access. Our exciting catamarans are equipped with fresh water showers for when you're finished snorkeling, and there's plenty of deck room to stretch out in the sun or head to the shaded area for a refreshing break after snorkeling or on the return trip. The afternoon reef snorkel tour provides complimentary water and soda to keep you hydrated, and for our adult passengers, we offer complimentary beer and wine on the return sail to Key West.